Roddenberry, Gene. Star Trek. 1966-1969. Streaming media. “Journey to Babel.” Star Trek CBS. 17 Nov. 1967. Television. “Spectre of the Gun.” Star Trek. CBS. 25 Oct. 1968. Television. “Amok Time.” Star Trek. CBS. 15 Sept. 1967. Television. 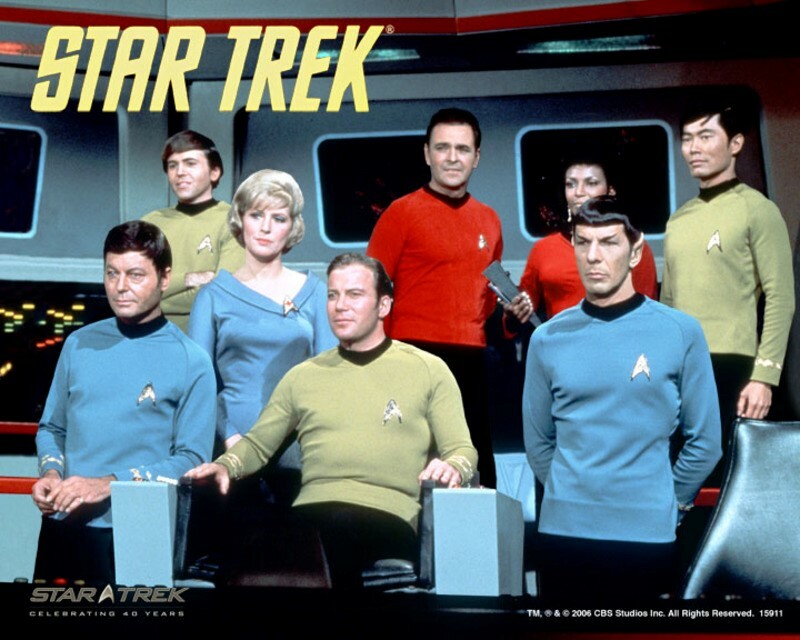 Sometimes first officer, sometimes captain, but always Mister, the half-Vulcan, half-Human Spock is an iconic figure in science fiction television. For the majority of his televised life he holds the post of science officer and second-in-command of the USS Enterprise. His self-chosen role as largely Vulcan is relied on in the show: he’s the science officer, their logical person, the one who comes up with the plans and double-checks other peoples’ ideas. 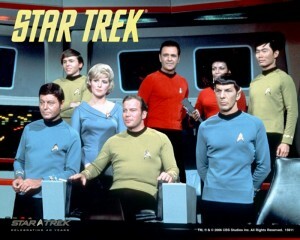 Sometimes he is directly involved in a given episode’s conflict, as when he and Kirk are forced to fight for the favor of a Vulcan woman (“Amok Time”, 1967). Sometimes he is part of an intergalactic object lesson, as in the episode where the crew grows suspicious and mistrustful of Spock because of his topical resemblance to a Romulan. More often than not, though, Spock is a fixed part of the crew, more notable for his Vulcanic displays of dependable, logical nature and his interactions with his crewmates than anything specifically involving his mixed heritage. His heritage, however, dogs him throughout the series. In general he prefers to embrace his Vulcan appearance and heritage, with its logic and lack of emotion; a query exploring his feelings or probing the true motive of some decision – which may be based in emotion, eh Spock? – is most often met with a raised eyebrow and bland response. He’s sparing with details about his life before the Enterprise, but the series does draw out details of his heritage over time. It comes out in the 1967 episode “Journey to Babel” that Spock fits a traditional neither-here-nor-there mixed-race trope: as a child he was bullied and harassed because of his heritage, because the other children saw him as failing to measure up to the Vulcan ideal of emotionless logic. He was raised on the Vulcan homeworld in the Vulcan tradition and enrolled in Starfleet against his father’s wishes (“Journey to Babel”, 1967), causing a rift in the family even though his judgment and competence are highly respected in Starfleet. Brought up with constant reminders of what he is not on planet Vulcan, yet unable to pass for human (more emotionally than physically, since on more than one occasion he dons a hat to hide his ears and goes unremarked among humans), he’s found a home in Starfleet where he can be judged as he is, not as he should be. One of the more interesting aspects of Spock’s mixed heritage in the relatively judgment-free environment that is the Enterprise is the flexibility with which he emphasizes each side of his heritage, and when, and for what reason. While he generally pretends that he is entirely Vulcan in body and mind, it is accepted that this is a pretense – nearly every episode, someone on the crew asks with a smile whether he’s absolutely positive that there’s no emotional reason for a piece of behavior. Captain Kirk in particular asks these questions with a twinkle in his eye, and often receives cryptic or quietly telling answers. Yet Spock wields his emotional, human half with remarkable dexterity when necessary. In the episode “Spectre of the Gun”, when mysterious aliens create a powerful illusion that traps the away team and appears to kill Chekov, he reminds his grieving crewmates that he is, in fact, half human – a rare display of solidarity indeed, given that the majority of his emotional interaction with the crew is conducted via poker face and subtle allusion. Conversely, in the episode “The Immunity Syndrome” he has a bonding moment of concern for Kirk with Dr. McCoy by emphasizing that “even [he], a half-Vulcan”, can be deeply concerned about a friend. He emphasizes halves of his heritage depending on the situation, if he emphasizes any at all – by doing so, Mr. Spock has made himself a place where he can choose how to present his identity and have that decision respected by his colleagues.